Here is the straight truth of the matter, even if you still have never found “the one,” or you think you have lost them completely- you are always near a plenty of soulmates in your life all the time. Soulmates come in all shapes and sizes in our lives. Did you know your soul mate can be your boss, your sister, your father, your aunt, your grandparent, your best friend, your client or even a pet? Soulmates are those people (and animals as well), who we always encounter in those timely ways as we “coincidentally” align once again with through the synchronicity of life. These are the special people that within 5 minutes of encountering them for the first time (within this physical life), you just “know” and are completely comfortable with without hesitation. You somehow gel right away, and sense this yearning to get to know one another better, as you more than likely feel like you’ve known one another for years. What else can we learn about this grossly misunderstood term of “soulmates” from the ancient practices of numerology and the innate wisdom of lexigrams when we ponder what’s really in a word? The Chaldean practice of numerology utilizes the profound understanding of karmic mysteries with compound numbers. One should not be surprised ‘soulmates’ carries the Chaldean’s understanding of the 36’s The Sceptre which is one of the compound numbers they considered to associate with extreme fortune and karmic rewards. Within the 36 Chaldean Karmic Mystery, we find accurate concepts to consider when we are talking about soulmates. How many times have we all discovered within the initial excitement of knowing one of our soulmates are around- that we feel ever so enchanted and stimulated within our imagination? Here is where the advice of the 36’s The Sceptre is a wonderful reminder of what it means to know we are receiving our karmic rewards. Encountering our soulmates again typically allows us to feel incredibly fortunate. There is a power ignited within us more often than not by our soulmates, and one that is not shy about the courageous presence it brings along with it. The Chaldean practice of numerology also, like astrology, attaches a planet to each of the singular numbers that specifies the channel of energy coming through it. Adding 3 + 6 together, we find the 9, whose singular energy is ruled by Mars- governing over our courage, conclusions, motivation, aggression, conflict, desires and our abilities to become the warrior within our lives. As we already know, anytime we are engaged with soulmates, depending upon the nature of the individual relationship, our courage may be tested for its’ strength. Equally, as Abraham Hicks deeply understands as well, if one’s soul mate is not giving us grief, they aren’t a good soul mate at all. 9 energy favors facing our conflicts and coming to conclusions from what was left unresolved from the last go around the karmic block. Soulmates often test us to become more aware of our warrior presence- and more often than not our ties with family ones, may most often bring our greatest tests for us to overcome and learn from. The mysteries of Lexigrams support further meaning within SOULMATES. By taking the anagrams we can derive from words, and spiral them into poetic phrases, the Lexigram process brings in one more piece of the puzzle to place into our mastery of life about what’s really hiding within any of them in truth. How can we also reap the rewards from SOULMATES? The reality we can assimilate into our human experiences, is as always, ready to be spelled out from the very letters that compose it. To the Souls Who Believe, Happy Valentine’s Day Dear Stars! Remember to always LOVE to EVOLVE with your Soulmates all 365 days of the year. You already hold the keys to your success. Your Name & Birthday, simply unlock the door. If you are a regular follower of our monthly Word Ponder, you’ll have innately grasped from October how mercury retrograde is a favored time to reroute our cores to take time to reflect, retreat and review: returning us to a refreshed state of being realigned in our source energy in November. So now we wonder as we think about where to ponder next, perhaps you just might already be one of those people who are in the space of understanding THE LAW OF ALLOWING, making for all kinds of new wow in your now. Where did ‘The Law of Allowing’ originate from? We decided to ponder the term The Law of Allowing because the very question, what’s really in a word? will clarify that indeed -as we have already done with The Law of Attraction & The Law of Creation– when we understand what the law of allowing actually is, there are multitudes of rewards for us to reap. If you acknowledge when you are aligned in your source energy- you may already be very tuned into this concept of understanding how much then, you naturally begin to know the grave difference of when your free will is in the state of allowing verse when it is not. A tremendous shift is ongoing within our modern day world that finds more and more people seeking answers to become “one” and connect with the whole of humanity without losing their sense of individual self. These answers, can be very deeply understood when one is in full comprehension of what it really means to practice the law of allowing within their lives, and witness the very joy it truly brings. What does it take to routinely practice The Law of Allowing? It takes a rhythm that is attuned to a vibration. Every sound we utter contains an unseen channel of energy. Thus, when we speak our names and engage within the action of our words, there is an underlying current, this guided force that connects that vibration to the quantum possibilities of it’s own individual expression. No matter what name, title or word we are looking at, there is a numerological energy that is always behind it through the combined values of the letters that compose it. Name expressions in their letter to number match-up always will provide after they are calculated, the very keys to know what points of attraction of our names, titles and words provide. Herein lies priceless guidance of exactly what to appropriately choose within our conscious actions to be able to reap our benefits. The Chaldean practice of numerology utilizes the profound understanding of karmic mysteries that are associated with the compound numbers. One should not be surprised The Law of Allowing is guided by the Chaldean’s understanding of the karmic blessed 23, The Royal Star of the Lion which is one of the compound numbers they considered to be extremely beneficial. When proper intention and focus are applied, the rewards are amazing once one is within it’s alignment. Within the 23’s Chaldean Karmic Mystery, we find very on point concepts to consider when we are in the space of engaging in The Law of Allowing. One of the things Abraham discusses when aligning in The Law of Allowing is the concept that when we choose to be an allower, there is absence of negative emotion. Many people confuse “allowing” with being tolerant. Should we choose to tolerate in life, we are harboring ill-feelings, because we are putting up with situations and circumstances we do not like. As we better understand The Law of Allowing, the freedom we are meant to experience through it, only comes by focusing upon the solutions to what problems we may see to shift the energy into a different space. As we allow, we are pro-active to always be in solution mode, and simply let people create the life they want to, as we mindfully create the life that we want to see unfold. Once again it is our very point of feeling that sets up the stage for what ultimately thereafter attracts to us. The Chaldean practice of numerology also, like astrology, attaches a planet to each of the singular numbers that specifies the channel of energy coming through it. Adding 2 + 3 together, we find the 5, whose singular energy is ruled by the Mercury- governing over our communications, movement, versatility, and abilities to bring our ideas and thoughts to fruition within of our lives. When we take the 2 and 3 from The Royal Star of the Lion’s 23 -and look at them individually- it is also easy to see how much nurturing of our feelings is required to educate our beliefs to be able to properly align in The Law of Attraction. As the Moon guides the 2, we find the channel of imagination, sensitivity, parenthood, and the rawness of our emotions. The 3’s guidance from Jupiter, offers the channel of optimism, philosophy, higher education and the abilities to find wisdom. Coupled together, the 2 and 3 give that punch to connect our emotional beings to the state of believing- moving us to express what it is that they arrive at within the energy of 5. As we engage in the practice of The Law of Allowing, another point to note is what the singular 5’s guidance of the 23 does here for anyone through the channeling energy of Mercury. 5 is also known as The Messenger, in where all of our knowledge, thoughts, ideas, logic, and means to adapt in life are processed. Ask anyone who can properly educate you about the Law of Attraction, and they’ll relate that if you are not feeling good, you won’t think all too well either to be able to manifest the life you wish to see, and you’ll just keep believing life is a struggle verses witnessing the joy it is absolutely meant to bring you. Ask anyone who already enjoys a routine practice of utilizing The Law of Allowing, and they will probably share with you that they are more than aware of how their thoughts and mentality are one of the key parts of creating the direct experiences that happen in their lives. Those who choose to understand The Law of Allowing, find their lives become more joyful and happy, because they have done the necessary soul homework to allow themselves to resonate in their truth. The Law of Allowing is all about what you channel into your state of mind. Aligning what you are emotionally feeling upon this earth in true thought that resonates to the Higher Self that is always available to you along your journey. Nurturing the self, your cup, and filling it up with positive emotion so what follows when you then think, allows you to become the proactive person who is always the solution seeker. Knowing you want, being fully aware of what you do as you let yourself be as you are- you will find you will equally be able to allow others to be who they are, completely in the state of imperfection. Remember, perfection is a journey, a JOURNEY to ENJOY YOUR JOY, not a permanent destination. Life itself is absolutely 110% imperfect. When we allow this, we know we are engaged fully in The Law of Allowing. The mysteries of Lexigrams have more evidence to support the meaning within THE LAW OF ALLOWING, and what it is simply able to do for any of us. By taking the anagrams we can derive from these words, and spiral them into poetic phrases, the Lexigram process brings in one more piece of the puzzle to place into our mastery of life about what’s really hiding within it in truth. The reality that relates to how to best reap the rewards from THE LAW OF ALLOWING wishes for us all to assimilate into our human experiences, is as always, ready to be spelled out from the very letters that compose it. WHAT A GIANT GIFT TO LET THE HEALING FEELING FLOW IN LIFE IF I OWN IT NOW! OH AH HA… WHEN I WILL IT NOW… I WON! To Your aligning in The Law of Allowing that promises you’ll ENJOY YOUR JOY along your JOURNEY. If you are a regular follower of our monthly Word Ponder, you’ll have innately grasped from June how achievement is truly an act of uniting in intuition, allowing you to enjoy the affirmations that give you plenty to celebrate about in the realms of meditation during July. So now we wonder as we think about where to ponder next, perhaps you just might already be one of those people that deeply understand -to always maintain your peace of mind- engaging in the practice of CONCENTRATION will take you to an even higher plane of existence. Concentration is primarily defined as: “the direction of all thought or effort toward one particular task, idea, or subject.” We decided to ponder this word because the very question, what’s really in a word? clarifies indeed, that the energy within and surrounding what it takes to concentrate is able to reward us in a multitude of ways. If you acknowledge when you are in the act of meditation- you may already be very tuned into this concept of emptying your mind or finding ways to concentrate on one thing makes a huge difference in what you find yourself achieving. As the wonders, mysteries and changes of everyday life come to you in your now, what happens when you schedule that meditative time to concentrate into your regular self-care routine? To recognize our achievements, meditation is a path that sharpens our inner saw so we can be more aware of them, resulting in the deepening of our spiritual experiences. But in order to properly meditate, one will find it is concentration that holds the keys to receiving its’ rewards. And what rewards we can find in our fast paced modern day world when we hone in upon what we are meant to fully concentrate upon. As we are bombarded by distractions beyond our control daily, knowing how to develop the skill of concentration almost seems essential to our human survival. In this existence of constant change within our common culture, equally, it is interesting to discover how the ancient’s tools of Chaldean Numerology and Lexigrams view concentration. What does it take to enjoy a routine practice of concentration? It takes a rhythm that is attuned to a vibration. Every sound we utter contains an unseen channel of energy. Thus, when we speak our names and engage within the action of our words, there is an underlying current, this guided force that connects that vibration into it’s own individual expression. When we examine the Name Expression of CONCENTRATION -which is the numerological energy that is always behind it through the values of the letters that compose it- we find it has, as numbers always will provide, the very key points to know what exactly to do within the action of it. One should not be surprised it is guided by the Chaldean’s understanding of the 52, which is one of the compound numbers they considered to be associated with careful attention to align within it properly. Adding 5 + 2 together, we arrive at the 7, whose singular energy is ruled by Neptune- who governs over our intuition, meditation, solitary acts and inner processes across the board. Ask anyone who already enjoys a routine practice of concentration, and they will probably share with you that they regularly schedule time for the self to reflect and become renewed. Most people who choose to concentrate, find their lives become not only more aware, but equally intuitive and receptive to owning their now. That definition might alarm one right away to avoid any act of concentration, but it is taking our numerological insight a step further to truly comprehend what the Chaldeans meant here. 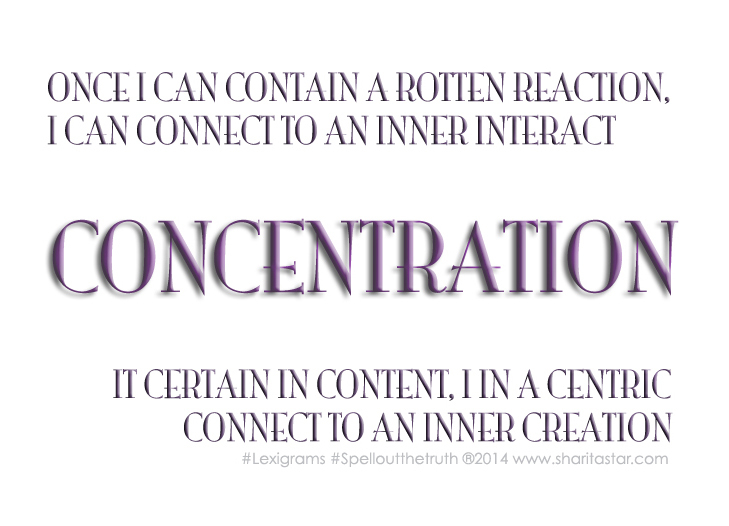 Looking as well to Yogananda’s quote about concentration, equally ties into the clues about why this practice is what ultimately guides us through “trickier” waters. As all humans do experience challenges and apparent storms of life, these situations present the times that our concentration is necessary the most to be able to reach the shores of calm and clarity. The 52 vibration of this very word carries this meaning because we more often than not, have to navigate our ships through those times of choppy waters. How many times have we already discovered how much within the practice of concentration we may have instead become part of the storm, rather than remaining within the eye of it? When we take the 5 and 2 -and look at them individually- there is even more profound advice associated within the act of concentration. As Mercury guides the 5, we find the channel of movement, permanent change, blossoming, and communication stirring with messages for us to receive. Coupled with the 2, guided by the Moon -who directly guides our imagination, sensitivity and emotional state of being- one can bank that those waters are more than interesting to navigate through with success. Both Mercury and the Moon in this combination tell us through the act of concentration, we should undoubtedly expect that we will move through any kind of feelings we are experiencing to allow changes to assist the further evolution of our lives no matter how rough the storm may be. Remember too, these are the two closest planets from above that constantly affect what we emotionally perceive and well as the energy behind how we will then choose to think moving forward about it down here below. As we engage in the practice of concentration, another point to note is how the outward and singular 7’s guidance is expressed through the intuition of its’ ruling planet Neptune. 7 is known as The Seeker, in where inner work and time alone to do so mark the actions that this number is associated with. Regular concentration always will bring us to a constant state of keen awareness within our minds. Yet, it is the true act of taking time away from the world at large and all of the energy surrounding us, to seek our individual peace of mind. Unlike Name Numerology, where in it would be advised to never have a personal or business name carry a 52 vibration, the warnings that the 52 casts off within concentration are avoided when we do choose to not become caught up in the storms within life that will always be present in some kind of capacity. No matter where we are in the world, revolution, upheaval, strife, conflict and war exist. Do we allow ourselves to become consumed with repeated disappointment and failure by the unhealthy habit of choosing to concentrate upon it? When one chooses to concentrate on what they ultimately can control (which aligns from further knowing it is only what they can create themselves), they will find they can steer their ship through any kind of waters to the shores where blessings await. We all live in a modern day world where circumstances allow us to hear about other people’s and the world’s problems in a constant state of availability thanks to the mainstream news and social media. It is up to us to discern what we choose to focus upon. The world’s and other people’s problems will always exist, and the only true power we have is to make sure our personal lives are being handled appropriately. Once we are centered and grounded, we can offer proactive assistance from the space of concern, engaging us in solution seeking mode. The mysteries of Lexigrams have more evidence to support the meaning within CONCENTRATION, and what it is simply able to do for any of us. By taking the anagrams we can derive from this word, and spiral them into poetic phrases, the Lexigram process brings one more piece of the puzzle to place into our mastery of life. What’s really hiding within the word concentration to spell out the truth? The reality that relates how we can best reap the rewards this word wishes for us all to assimilate into our human experiences, is as always, ready to be seen from the very letters that compose it. To Your Concentration that allows you to sail smoothly to your blessed shores. If you are a regular follower of our monthly Word Ponder, you’ll have innately grasped from May how self-realization is truly an act of uniting in intuition, allowing you to enjoy the affirmations that you have plenty to celebrate in the realms of achievement during June. So now we wonder as we think about where to ponder next, perhaps you just might already be one of those people that deeply understand -to now maintain your peace of mind- engaging in the practice of MEDITATION will take you to an even higher plane of existence. Meditation is defined as: “the emptying of the mind of thoughts, or concentration of the mind on just one thing, in order to aid mental or spiritual development, contemplation, or relaxation.” We decided to ponder this word because the very question, what’s really in a word? will clarify that indeed, the energy within and surrounding what it takes to meditate is able to reward us in a multitude of ways. If you acknowledge when you are experiencing achievement- you may already be very tuned into this concept of emptying your mind or finding ways to concentrate on one thing makes a huge difference in what you find yourself achieving. As the wonders, mysteries and changes of everyday life come to you in your now, what happens when you schedule meditation into your regular routine? To recognize our self-realization and achievements, meditation is a path that sharpens our inner saw so we can be more aware of them, resulting in the deepening of our spiritual experiences. Once viewed as a more “new age” kind of approach to life, meditation is quickly becoming more mainstream, even within our modern day business and corporate environments. One of the most recent revelations this past Spring was aired on ABC about this growing “trend” as Anchor Dan Harris segmented the power of meditation -being so astounded by his results- he wrote an entire book about his own journey of practicing it, 10% Happier. Aside from what is changing within our common culture, equally, it is interesting to discover how Chaldean Numerology and Lexigrams view meditation. What does it take to enjoy a routine practice of meditation? It takes a rhythm that is attuned to a vibration. Every sound we utter contains an unseen channel of energy, and thus, when we speak our names and engage within the action of our words, there is an underlying current, this guided force that connects that vibration into it’s own individual expression. When we examine the Name Expression of MEDITATION -which is the numerological energy that is always behind it through the values of the letters that compose it- we find it has, as numbers always will provide, the very key points to know what exactly to do within the action of it. One should not be surprised it is guided by the Chaldean’s understanding of the 36, which is one of the compound numbers they considered to be extremely fortunate. Adding 3 + 6 together, we find the 9, whose singular energy is ruled by Mars- who governs over our courage, penetration, pioneering pursuits and attitude towards anger. Ask anyone who already enjoys a routine practice of meditation, and they will probably share with you that they feel more courageous, grounded, calm, and are clear about where they point their outward actions. Most people who choose to meditate, find their lives become not only more fulfilled, but equally more efficient. Makes you want to get thee to practicing meditation right away doesn’t it? Within the action of emptying our minds or choosing a focus that allows us to enhance our connection to soul, what spiritual rewards are then to follow! Who wouldn’t choose meditation to reap a richer harvest, be in command of their mindset, feel more empowered, all on the good side of truly enjoying the gratifying side of what karma can reflect. When we take the 3 and 6 -and look at them individually- there is even more goodness associated within the act of meditation. As Jupiter guides the 3, we find the channel of optimism, higher education, philosophy, spiritual joy and the true seeking of aligning the body, mind and spirit. Coupled with the 6, guided by Venus, oh what harmony and balance is here to innately embrace, as this number strives completely to seek to understand, then be understood. Both Jupiter and Venus are known as benefic planets, where ease, joy, and pleasantries are their influences if one is not abusing their natural privileges. As we engage in the practice of meditation, another point to note is what the singular 9 guidance does here for anyone through the motivation of Mars. 9 is known as The Finalizer, in where conclusions and endings mark the actions that this number brings. Regular meditation always will bring us to a constant state of closure within our minds, in where, as we settle our busy thoughts and empty it -or choose a primary focus- we ultimately release and let go of the energy that does not serve us. This is how the rewards of the higher vibration of the 36 come shining through. For as we regularly conclude thought patterns that are not producing the results we wish to see unfold, the very act of meditation ends the pattern. Every time a form of meditation is practiced, the clean slate of a fresh, clear and ready to go mind is what we take away to move forward with. Whether once chooses to meditate by emptying the mind, this practice can be also enjoyed through the simple act of taking a walk, chanting, yoga, music, art, tai chi, and plenty of other avenues. One of the easiest ways to enjoy these benefits -however you may choose to meditate- is to remember to focus upon the breath. No matter what might show up in one’s mind, the return to the breath is the fundamental rule of meditation. What pleasure it really is to deeply BREATHE, so we BEAT THE HATE, BATHE THE HEART RATE, BE THE EARTH EAR. The mysteries of Lexigrams have more evidence to support the meaning within MEDITATION, and what it is simply able to do for any of us. By taking the anagrams we can derive from this word, and spiral them into poetic phrases, the Lexigram process brings one more piece of the puzzle to place into our mastery of life about what’s really hiding within it in truth. The reality that relates to how to best reap the rewards this word wishes for us all to assimilate into our human experiences, is as always, ready to be spelled out from the very letters that compose it. To Your Meditations that allow you to soar to those higher planes of existence. If you are a regular follower of our monthly Word Ponder, you’ll have innately grasped from April how accomplishment is truly an act of uniting in intuition, allowing you to enjoy the self-realization that also affirms you cannot attain it without the same during May. So now we wonder as we think about where to ponder next, perhaps you just might already be experiencing the realms of ACHIEVEMENT? Achievement is defined as: “something that somebody has succeeded in doing, usually with effort; the act or process of finishing something successfully.” We decided to ponder this word because the very question, what’s really in a word? will clarify that indeed, the energy within and surrounding achievement is always awaiting for you to recognize it, even in the smallest feats within our lives. By now, if you acknowledge when you are experiencing self-realization- you are more than likely already very tuned into what your soul is here to accomplish. As the wonders, mysteries and changes of everyday life come to you in your now, are you feeling any sense of achievement yet? Like accomplishment and self-realization, the desire to succeed while equally feeling good within our personal potentials are very basic human goals. How many times have we all been asked, “So what are you feeling good about that have you achieved up till now within your life?” Depending upon our answers, we find there may be a myriad of responses that present themselves- once again that may not be measured by the status quo definition of overwhelming success that comes with dollar signs attached to it. Equally, it is interesting to discover how Chaldean numerology and lexigrams view achievement. What does it take to enjoy a routine sense of achievement? It takes a rhythm that is attuned to a vibration. Every sound we utter contains an unseen channel of energy, and thus, when we speak our names and engage with the action of our words, there is an underlying current, this unseen force that connects that vibration into it’s own individual expression. When we examine the Name Expression of ACHIEVEMENT -which is the numerological energy that is always behind it through the values of the letters that compose it- we find it has, as numbers always will provide, the very key points to know what exactly to do within the action of it. One should not be surprised it is guided by the Chaldean’s understanding of the 44, which is one of the Master Numbers because it is composed by two 4’s in one compound number. Adding them together (4 + 4 = 8), we know the singular energy of the 8 is ruled by Saturn- who governs over our responsibility, stability and learning through our experiences. Looking back to accomplishment and self-realization, both carrying 2 vibrations that are guided by the Moon’s ebb and flow of emotion, we now switch from the intuitive side of life to the physical manifestation of what guides us from within through the wisdom of the 8. Seemingly, there is “work” to be done in the energy of the 44, and as we find that singular 8’s guidance through Saturn here, again, we should not be that surprised. In the means of achievement, we can translate the ancient Chaldeans’ perceptions to our modern day world to find grace within our toiling actions and claiming of it. In order to have the power that comes with achievement, compassion and unselfishness is part of the process, and should never be placed in worthiness of the self in order to avoid the natural contradictions it can bring. When working with the material 8, as we take away the self and better comprehend our connection to all that is, our achievements can be all the more rewarding. One question we can always ask to keep in true alignment of achievement is: whom have I helped along the way to arrive at it, allowing them to remove their obstacles along the way? When we take the two singular 4’s, and look to the digits composing this master number vibration, we find two forces of Uranus guiding the inner workings of this master number. This innovative planet never ceases in the unexpected it can bring when we least anticipate it, which is the only means of how break-through and originality ever enters our lives. With the coupling of two 4 energies, we have two individual foundations asking to be respected and acknowledged, each providing a worth that allows the 8’s wisdom to come through in a channel that requests patience to be a part of it. Why, this master number is nothing short of “tricky” to truly understand, for to receive the natural gifts of it, one has to be mindful of knowing how to work with humanity at all times, another request that the 4 will always ask anyone guided by it to honor. As we engage in the riches of achievement, we honestly find it has nothing to do with the manifestation of material rewards for the self to indulge. While intuition and those personal hunches must be carefully listened to in order to invest in the future of the self, (ignoring that bad advice of society’s norm to “get rich” and trust in others that do not honor what having true wealth really means), it is through the compassionate acts that help others which will lead to the stability that achievement is poised to bring. Knowing what one has done in generosity -especially to those who may need it the most- reflects back the strength and solidarity that are the genuine roots of this more than powerful and masterful word. The mysteries of Lexigrams have more evidence to support the meaning within ACHIEVEMENT, and what it is simply able to do for any of us. By taking the anagrams we can derive from this word, and spiral them into poetic phrases, the Lexigram process brings one more piece of the puzzle to place into our mastery of life about what’s really hiding within it in truth. The reality that relates to how to best reap the rewards this word wishes for us all to assimilate into our human experiences, is as always, ready to be spelled out from the very letters that compose it. If you are a regular follower of our monthly Word Ponder, you’ll have innately grasped from March how happiness is what happens from within, allowing you to enjoy the accomplishment that also affirms this is part of the personal journey during April. So now we wonder as we think about where to ponder next, perhaps you just might already be experiencing the realms of SELF-REALIZATION? Self-realization is defined as: “a fulfillment of personal potential.” We decided to ponder this word because the very question, what’s really in a word? will clarify that indeed, the energy within and surrounding self-realization is always awaiting for you to embrace it. By now, if you recognize when you are experiencing accomplishment- you are more than likely already very tuned into what your potential truly is. As life shows you more of what you are every single day of existence, are you feeling any sense of self-realization yet? Like accomplishment, the desire to sustain oneself in the stream of personal potential is another very basic human goal. How many times have we all been asked, “So what have you realized up till now within your life?” Depending upon our answers, we find there may be a myriad of responses that present themselves- which are much more humble and relate to our dreams than we might originally think. Equally, it is interesting to discover how numerology and lexigrams view self-realization. What does it take to enjoy a routine sense of self-realization? It takes a rhythm that is attuned to a vibration. Every sound we utter contains an unseen channel of energy, and thus, when we speak our names and engage with the action of our words, there is an underlying current, this unseen force that connects that vibration into it’s own individual expression. When we examine the Name Expression of SELF-REALIZATION -which is the numerological energy that is always behind it through the values of the letters that compose it- we find it has, as numbers always will provide, the very key points to know what exactly to do within the action of it. One should not be surprised it is guided by the Chaldean understanding of the 2, which represents the pure concepts of imagination, parenthood and sensitivity. Knowing the singular energy of the 2 is also ruled by the Moon -who governs over our emotions- here in lies the real key to tap fully into this marvelous word that can bring us such fulfillment. When we take the self, and combine it with realization, within this blending and pairing of two 1 vibrations, the outcome of this Name Expression holds more details to share. As 1 + 9 = 10, 1 + 0 = 1 and 3 + 7 = 10, 1 + 0 = 1: our 1 + 1’s = 2. Whenever we see 2, we have the guidance of The Nurturer right by our side, backed up by The Moon’s, instinct, emotion, and imagination. Looking at the combination of the 1 + 1, we have an inner double influence of the Sun’s asking for creativity, benevolence and protection. While the self will always seek on its’ own the realms of initiation that the 1 always requests, as it discovers this through what equally wishes to begin through realization, the very action of self-realization bring us to that desired reflective feel. As this taps us into a pure innate state of being in a space where we are vulnerable to what is beyond the flame that sparks our journeys, we can be at peace with what spending time in contemplation of it all really means. As the self works with realization, we master it by uniting that we are promised happiness and fulfillment, allowing us to acknowledge our success through those accomplishments as well as in the personal life- with the discipline and dominion that engaging in realization brings. By choosing to be fully within what we can Imagine and then Ordain, we can manifest our highest potential to be the creative being we can here to be. What few might conclude is that in The Wheel of Fortune’s constant spin, it is knowing the realizations we arrive at, are soon enough to change once again. And so another clue about the outer Name Expression here of the singular 2, being ever guided by that imagination and what we feel, there is no consistency to self-realization. Just like the Moon itself -the fastest moving vessel in our skies above- our state of emotion and what we realize keeps changing and evolving as we continue upon our grand journey of life. The mysteries of Lexigrams have more evidence to support the meaning within SELF-REALIZATION, and what it is simply able to do for any of us. By taking the anagrams we can derive from this word, and spiral them into poetic phrases, the Lexigram process brings one more piece of the puzzle to place into our mastery of life about what’s really hiding within it in truth. The reality that relates to how to best reap the rewards this word wishes for us all to assimilate into our human experiences, is as always, ready to be spelled out from the very letters that compose it. If you are a regular follower of our monthly Word Ponder, you’ll have innately grasped from November how to use EFT (Emotional Freedom Technique) within your life and be able to tap (literally) into the wonders of how your positive thoughts are so much easier to reach during December. By now, you may have already started to deeply understand that you are more than aware of the connection between what you feel and what you think results in all that you are creating within any given area of your life. What happens when these practices are fully implemented within our habits and routines? Welcome to the community of the MENTALLY STRONG PEOPLE. When one is mentally strong, there is a resilient discipline that is part of maintaining a mindset that doesn’t falter under pressure. The determination that unfolds from one who has control over their feelings, equally finds that they work on them routinely to be able to delegate the free-will’s choice of responding verses reacting to whatever may show up to handle within their lives. Thus, as this practice is maintained, and ideally mastered, the strength that is able to unfold reaches to places far beyond what the mind itself can perceive. The energy of the singular 5 (2 + 3 = 5) -being guided by the planet Mercury- is the very one who guides over our thinking, mentality, communications and the ability to make movement happen in life. Mercury is the energy behind the fast changes we see emerge, and often these are permanent in nature. How wonderful to know, when one is considered one of the mentally strong people, they are always within the means of adaptability, versatility, and in the space of allowing whatever challenges show up, to not get them down. As you find yourself recognizing your are on the team of the mentally strong people, adapting to the field of energy that the 23 bestows so intensely relates that you surely can handle what comes your way. When the 23 is present –as it is when you are part of the mentally strong people- you are practically guaranteed to always find the help necessary to come through difficult times with an abundant grace, backed by a strength that doesn’t go away when you need it the most. We all live in a modern day world that is flooded with negative energy swirling amongst us, coupled with an unnatural pace that is allowing our human race to suffer the more and more we carry on further within its grasp. However, amongst all of that, it is the means of remaining in the mentally strong people community that allows one to filter that outside world, and understand how to navigate successfully without subscribing to everyone else’s gloom and doom. The mentally strong people are ones who take up in the 23’s gifts, and rise to incredible levels of success in their careers and personal lives, always becoming succinct with the changes and cycles that surround them along the journey. Just like this number’s title, there is a “royal lion” energy that is seen about them, wherein, they are most apt to shine upon their stages, rule their forests, while carrying a humble presence that is indeed one that showers admiration and appreciation upon them. Equally within the energy of the singular 5, what joys do exist within what can be channeled through the mindset, blossoming into amazing ideas and in ways that the masses are meant to hear them. Not only do mentally strong people keep their mindset running like a fine tuned engine, but their ability to communicate those positive thoughts are at times a true sight to behold. It almost appears like nothing can get them down. And when anyone is engaged in the power of what the 5 truly means, it is allowing and deeply understanding change is simply what life is about. Nothing in our lives is permanent. Mentally strong people completely, 110% master this concept. This is why, they constantly work on their emotions, their thought processes, and recognize that adapting to any change gracefully is always what it takes to live a life of success, one that is guided by purpose and meaning. Mentally strong people arrive at a powerful realization that in order to remain healthy within their mind, regular work is always moving and being learned for self-growth. Mentally strong people become dear and lifelong friends with the concept of change. The mysteries of Lexigrams have more evidence to support what the true meaning of joining the community of MENTALLY STRONG PEOPLE is able to do for any of us. By taking the very anagrams we can derive from this title, and spiral them into poetic phrases, the Lexigram process brings one more piece of the puzzle to place into our mastery of life about what’s really hiding within these words in truth. The reality that relates to how to best reap the rewards this gift of words wishes for us all to master in our human experiences, is as always, ready to be spelled out from the very letters that compose it. Happy Universal New Year Dear Stars. May your 2014 bring forth your strongest mental state yet. If you are a regular follower of our monthly Word Ponder, you’ll have innately grasped from October how to begin to utilize the Law of Creation within your life and tap (literally) into the wonders of how the Emotional Freedom Technique frees up our energy to do so over November. By now, you may have already started to deeply understand that you are more than aware of the connection between what you feel and how that is affecting what you are creating in any area of your life. So, with all that being said, how are you finding you have the ability to find the means to gravitate to a healthy place of generating POSITIVE THOUGHTS? It’s been the catch phrase for all of the law of attraction teachings out there to date, you gotta be thinking “positive thoughts” in order to make anything worthy unfold within your life. And if we don’t believe it, how in the world can we receive it? And what equally happens when the natural challenges show up for any of us to handle? How do we remain over these times, within the “glass is half full” perspective? When we examine the Name Expression of POSITIVE THOUGHTS -which is the numerological energy that is always behind it through the values of the letters that compose it- we find it has, as numbers always will provide, the very key points to know what exactly to do within the action of it. One should not be surprised it is guided by the singular energy of 9, which represents courage, penetration, aggressive action, and yes conflict. The 9 is known in Chaldean Numerology to be the The Finalizer, the very energy that always will bring forth with it, powerful conclusions to wherever it is getting the job done in life. The energy of 9 -being guided by the planet Mars- does get the bad rap on the not so happier tone of it’s channel of being a tell it like it is force in life that might alarm some, yet, underneath it all, there is always a genuine and forthright message it is conveying. You’ll find with the 9, honesty is always there, which can be penetrating if it is the kind that relates how much the TRUTH can HURT but it will grant that Mars motivation to always be free. As well as your positive thoughts should be. As you find yourself in the realms of thinking positive, have you ever experienced conflict from another who is not in the same mind set as you? You could have the biggest brainstorm on the planet and if you are in the presence of someone who would rather remain in their negative world, guess what comes at you, and more than likely in some sort of aggressive manner. In these moments, it truly does take every ounce of your courage to not let doubt come into play. What is strong within the 9’s energy over positive thoughts at the end of any day, is the intense desire to lead them to a Universal cause that does serve the entire whole. When positive thoughts are one’s habit, there is a determination that will never cease to find, even in the midst of life’s ups and downs, the means to handle any situation with grace and yes, that wonderful virtue of courage. It takes courage to practice positive thinking, and in relating it all back to how we are the creators of our lives here upon this earth, this means there is also immense effort involved. As we all live in a world bombarded by fear, it is true work and toil to rise above getting caught in the trap of patterns that do not allow us to reap the rewards we came here to unfold. Until we truly align those emotions in our lives, it is somewhat of a fight within to make positive thoughts become a healthy routine. Even within our own minds, without our feelings being in check, it is human nature to have a positive thought and then turn around and discredit it. Without that freedom in our feelings first, we are always in a fight to be able to truly believe any positive thought that can be inspired within our minds. Another fantastic analogy for knowing how wonderful the 9 can be, is to envision it as the warrior. What exactly does a warrior do? Typically seen in the fight, or warfare of some kind, the true meaning of being a warrior is more aligned to standing up for what is right, what is just, and what one believes, without engaging in the anger whatsoever. When it comes to positive thoughts, it is ending the very war that can rage within our minds, rising up in our deepest courage to allow the warrior energy to guard us against our own battles. One more note about the singular 9. This number is the one that connects us to the conclusions we naturally are meant to see all along the course of our lives. Knowing we do not come here to experience a “flat lined” life, if we take any of our human experiences, find gratitude even when the hard times find us, we are responding to life with the end result of bringing positive thoughts into all we create. Our number 9 is one that is marvelous to behold. It is a number that can never alter anything it touches, it only makes more of the same of whatever it is around. Add 9 to any number, for example 9 + 6 =15. Add 1 + 5 together. You are back to the 6. You can do this across the number spectrum. 9 never makes anything different, it just increases it’s vibration to more of what it already is. So remember, when you are in the act of positive thoughts, you are only going to keep bringing more of them near if you stay with them, be honest, and allow them to guide your personal warrior within. The mysteries of Lexigrams have more evidence to support what the true meaning of POSITIVE THOUGHTS can do for us all when we understand them properly. By taking the very anagrams we can derive from it, and spiral them into poetic phrases, the Lexigram process brings one more piece of the puzzle to place into our mastery of life about what’s really hiding within these words in truth. The reality that relates to how to best reap the rewards this gift of words wishes for us all to master in our human experiences, is as always, ready to be spelled out from the very letters that compose it. Happy, Healthy and Hopeful Thoughts Dear Stars. If you are a regular follower of our monthly Word Ponder, you’ll have innately grasped from August how to begin to utilize the law of attraction within your life and tap into the wonders of how the practice of manifestation does this over September. By now, you may have already started to deeply understand that you are opening up your ability to see how THE LAW OF CREATION is the actual way anything you manifest becomes your reality. No doubt -if you really comprehend that you are the creator of your experiences, being the captain who should be steering your own ship- we thought why not wonder and ponder what these words together can really share with us all. When we examine the Name Expression of THE LAW OF CREATION -which is the numerological energy that is always behind it through the values of the letters that compose it- we find it has, as numbers always will provide, the very key points to know what to exactly do within the action of it. One should not be surprised it is guided by -and we know by no Universal “coincidence” here- the very same Name Expression that ‘manifestation’ has, of the 13’s Regeneration – Change Chaldean Karmic Mystery. So, whenever you are operating in ‘the law of creation’ or in the action of manifestation, you are being asked to breakthrough the old norm, find new and original ideas within your mind, and go with the flow of the unexpected journey that will unfold within either of these processes. There is a stroke of genius that comes with the 13’s energy, and when we recognize it is thinking outside of the box that has to occur in order to create and manifest within our lives for ultimate success, we find a power to unleash that can serve our individual soul. Remember, cast off that worn out and silly superstition about the 13 being “unlucky,” for the ancient’s saw an innate way this number is meant to be understood. When one is on the true path of operating in the law of creation to manifest success in life, there is an individual and personal discovery that awakens an extreme power. When the habit of dominion has been implemented, the new ground will magnificently emerge. By allowing the free-will to take up in the response verses the react to whatever challenges arise- changes are no longer perceived from the perspective of fear, but of control, that which comes from tapping into your personal power. Whatever unexpected action is part of the human experience, it is the 13/4’s knowing that a strength begins to pour into the aware spiritual being. Regeneration is then assimilated into the soul, and here’s where the break-through into new exploration in life can be a process that makes the unknown something to anticipate, rather than remain in fear, resisting that change is a natural and healthy part of life. Back to the 13 and the properties of Uranus with 1 + 3 = 4, as the planetary singular guidance here. The 4 is our Innovator planet, promising the channel of possibilities to flow into the astonishing, extraordinary, diverse, with surprises certainly being part of the outcome when the ego is not involved. When one is engaged in the law of creation, it is always working, whether one is doing it positively or negatively. We even see here, with the further look to the two numbers composing the 13, that it is the self/creation (1) in the act of expression/growth (3) working together to unfold the structure that is going to be the solidarity and foundation (4) that other things can then begin to blossom and change (5) upon later. Should the self/ego (1) get too involved and blow things out of proportion recklessly (3), here’s where the outcome will bring that unexpected chaos (4) instead. Without the law of creation, there is no root system in order to feed the branches that are to bear the harvest of fruits in the future. One more note about the singular 4. In the ways that it’s energies flow in the different and unforeseen, (yet still being the glue that holds things as one in the sense of becoming the foundation), it has a particular association with the understanding of allowing verses tolerance in our lives. Think of the four sides of anything- there is a natural tension the four pieces hold in order to create the solidarity of the entire structure. Sometimes, this can result in a “boxed in” feeling when gravitating to the negative, and the outcome of feeling cornered or stuck unfolds. Tolerance does this very same thing. It creates an energy that “puts up” with stuff, and while no one may be raging outwards, there is something festering within that doesn’t serve the soul. The opposite comes from the shift to allowing. When we allow, it does not produce negative feelings, only a flow to let the world be, and we be in it as solution seekers. That’s a sure positive channel of the 4 being known to overcome any obstacle that comes their way, rather than remain stuck in resistance to it and let tolerance win. We also note an extreme karmic tie between the understanding of ‘The Law of Attraction’ and ‘The Law of Creation.’ Remember that the Name Expression behind The LOA is the 17’s The Star of the Magi, and it is guided by the presence of Saturn through the singular 8. It may make one wonder why so many people find it of interest, but soon gravitate to the feelings of Saturn’s restriction when trying to engage within it, and then simply declare, “this doesn’t really work.” There is a huge karmic bond between the 8 and 4 energies, so in the debate of what are we all doing in our human experiences, the terms ‘The Law of Attraction’ verses the ‘The Law of Creation’ are set up to be our teachers either way. Even your own planetary make-up will determine which one you find to be more attuned to your way of being: how your personally channel the 8 and 4 energies in your natal chart will determine your natural response to making up your own mind. The mysteries of Lexigrams have more evidence to support what the true meaning of THE LAW OF CREATION is when we understand it properly. By taking the very anagrams we can derive from it, and spiral them into poetic phrases, the Lexigram process brings one more piece of the puzzle to place into our mastery of life about what’s really hiding within these words in truth. You’ll remember from August, within THE LAW OF ATTRACTION, is THE LAW OF CREATION. The reality that relates to how to best reap the rewards this gift of words wishes for us all to master in our human experiences, is as always, ready to be spelled out from the very letters that compose it. CAN I TRAIN A NEW TRAIL TO FLOW IN, TO CRAFT IN LIFE? Learn more about The Law of Creation! Lexigrams are the phenomena of what’s really in a name. Are you ready to learn how to spell out the truth?